There are several interesting points in the above verses. The name Baca is the Hebrew name of Mecca. In addition, the designated House of Allah that was built by Prophet Abraham (pbuh), is in Mecca where yearly pilgrimage have been performing since the time of Prophet Abraham (pbuh)and Ishmael(pbuh), even to this day. The valley of Baca could indeed be the same as the valley of Mecca. The above verses refer to the place where Hagar, Ishmael and their children lived, in the valley of Mecca, where Prophet Muhammad (pbuh), was born either. Isaiah, 21:12-17 mentions “12 … In the forest in Arabia you will lodge … 15 for they fled from the swords, from the drawn sword, from the bent bow, and from the distress of war.” (Probable connection with the enemies mentioned in Psalm 83: 4-6 quoted above; also settlement in Arabia is confirmed; the verse 16 which follows, also confirms these verses are about Ishmaelites, Kedar being the 2nd son of Prophet Ishmael). Isaiah 42:1-13 – These are verses about “God’s elect servant” who will bring forth justice to the Gentiles. A point worth noting is that Gentiles are the non-Jews and it was confirmed by Jesus, peace be upon him, that he was sent to the Jews. 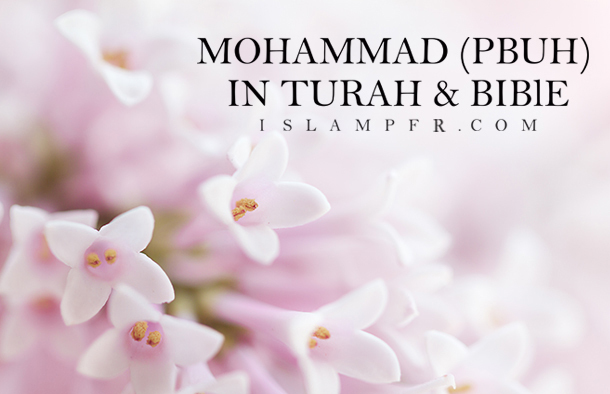 Moreover Muhammad, peace and blessings of God be upon him, is consistently named by God as Mustafa which means ‘elected’ and ‘Abd’ which means ‘servant’. Prophet Muhammad always referred to himself consistently as the ‘Servant of God’. The above verses cannot be about Jesus, peace be upon him, as many Christians believe, for at least two reasons. Firstly, the Christians and the Catholics describe him as the son of God and not the servant of God; whereas Prophet Muhammad is known exclusively as the Servant and the Messenger of God. Secondly, Jesus was sent exclusively to the Jews whereas Prophet Muhammad was sent among the Gentiles. There are several citations in the Bible prophesying the coming of Prophet Muhammad, peace and blessing of God be upon him. Isaiah 42:4 says, “He will not fail nor be discouraged, till he has established justice in the earth.” The Ministry of Jesus (pbuh) lasted only three years and at the time of his departure from this world it could not be truthfully said that ‘he established justice in the earth’. However, Prophet Muhammad, peace and blessings of God be upon him, preached for 23 years and most certainly ‘established justice in the earth’ before he departed from the earth. It is therefore reasonable to conclude that verses 1-13 refer to the coming of Prophet Muhammad (pbuh). Christians believe that this is a reference to Prophet Jesus (pbuh). One important word here is “Prophet”. Christians believe (pbuh) is the son of God not a prophet of God. Another important word is “brethren”. If it were Prophet Jesus (pbuh) the word would have been “children” because Jesus (pbuh) came from the children of Isaac. Since Ishmael (pbuh), was the brother of Isaac (pbuh), the reference is therefore to the children of Prophet Ishmael (pbuh) who will be brethren to the children of Isaac (pbuh). Again the only Prophet from the brethren of the Jews and the Christians was Prophet Muhammad (pbuh). The next important phrase is “… like you (Moses)”. Even a cursory comparison will show us that Jesus, peace be upon him, was very unlike Prophet Moses (pbuh). Prophet Moses’ birth was natural whereas the birth of Jesus (pbuh) was miraculous without a father, to a virgin, peace be upon her. Prophet Moses married and had children; Prophet Jesus did not marry and of course did not have any children. The ministry of Prophet Jesus (pbuh) lasted three years and did not see the laws of God establish in his time. Prophet Moses (pbuh), preached the law of God for many decades and saw in his time, the law of God established. Comparing Prophet Moses (pbuh) with Prophet Muhammad (pbuh) brings out an amazing similarity. Muhammad(pbuh)’s birth was natural, he was married and had children; preached the law of God for 23 years and saw in his own time God’s Law established in his land. The phrase: “I will put my words in his mouth”, takes on great significance because Prophet Muhammad, peace and blessings of God be upon him, was unlettered; he did not know how to read or write. Normally God would put the message in the Prophet’s mind. In this case attention is drawn towards “words” being put into the “mouth”. Prophet Muhammad’s sayings as well as eye witness accounts describe his receiving the verses of the Holy Quran, and his tongue moving with the words being put in his mouth. Turning to the New Testament, look at John 14:15-16. It says: “15. If you love me, keep my commandments. 16. And I will pray the Father and He will give you another ‘comforter’ (helper in other versions), that he may abide with you forever.” Also John 15:26-27, John 16:5-8 and John 16:12-14. Prophet Mohammad (pbuh) is praised upon earth and in the heavens, from the beginning to the end, by men jinn and angels, rocks and trees and animals, by prophets before him since Adam (pbuh), by saints until Doomsday. Also Muslims beg Allah to praise him by this words “peace and bless of Allah be upon him” because Allah is the only One who truly knows the value and the mystery of His Prophet Muhammad and Allah is the only One who can truly praise him. Abraham (pbuh) is widely regarded as the Patriarch of monotheism and the common father of the Jews, Christians and Muslims. Through his second son, Isaac (pbuh), came all Israelite prophets including such towering figures as Jacob (pbuh), Joseph (pbuh), Moses (pbuh), David (pbuh), Solomon (pbuh), and Jesus (pbuh). The advent of these great prophets was in partial fulfillment promise to bless the nations of earth through descendants of Abraham (pbuh) (Genesis 12:2-3). Such fulfillment is heartedly accepted by Muslims whose faith consider the belief in and respect of all prophets an article of faith. In Genesis, Ch. 21, Isaac is specifically blessed but Ishmael was also specifically blessed and promised by God to become a “great nation” in Genesis 21:13,18. According to Deuteronomy 21:15-17 the traditional rights and privileges of the first born son are not to be affected by the social status of the mother (being a “free” woman such as Sarah, Isaac’s mother, or a “Bondwoman” such as Hagar, Ishmael’s mother). This is only consistent with the moral and humanitarian principles of all revealed faiths. The full legitimacy of Ishmael as Abraham’s son and “seed” and the full legitimacy of his mother, Hagar, as Abraham’s wife are clearly stated in Genesis 21:13 and 16:3. After Jesus, the last Israelite prophet, it was time that God’s promise to bless Ishmael and his descendants be fulfilled. Less than 600 years after Jesus, came the last messenger of God, Muhammad, from the progeny of Abraham through Ishmael. God’s blessing of both of the main branches of family tree was now fulfilled. But there is additional corroborating evidence that the Bible did in fact foretell the advent of Prophet Muhammad. “A prophet like Moses (pbuh)”. There were hardly any two prophets who were so much alike as Moses and Muhammad. Both were given comprehensive law code of life, both encountered their enemies and were victors in miraculous ways, both were accepted as prophets/statesmen and both migrated following conspiracies to assassinate them. Analogies between Moses and Jesus overlooks not only the above similarities but other crucial ones as well (e.g. the natural birth, family life and death of Moses and Muhammad but not of Jesus, who was regarded by his followers as the Son of God and not exclusively a messenger of God, as Moses and Muhammad were, and as the Muslims belief Jesus was). Deuteronomy 33:1-2 combines references to Moses (pbuh), Jesus (pbuh) and Muhammad (pbuh). It speaks of God (i.e. God’s revelation) coming from Sinai, rising from Seir (probably the village of Sa’ir near Jerusalem) and shining forth from Paran. According to Genesis 21:21, the wilderness of Paran was the place where Ishmael (pbuh) settled (i.e. Arabia, specifically Makkah). Indeed the King James Version of the Bible mentions the pilgrims passing through the valley of Baca (another name for Mecca) in Psalms 84:4-6. Isaiah 42:1-13 speaks of the beloved of God. His elect and messenger who will bring down a law to be awaited in the isles and who “shall not fail nor be discouraged till he has set judgement on the earth.” Verse 11 connects that awaited one with the descendants of Ke’dar. Who is Ke’dar? According to Genesis 25:13, Ke’dar was the second son of Ishmael (pbuh), the ancestor of Prophet Muhammad (pbuh). Habakkuk 3:3 speaks of God (God’s help) coming from Te’man (an Oasis North of Madinah according to J. Hasting’s Dictionary of the Bible), and the holy one coming from Paran. That holy one who was under persecution migrated from Paran (Mecca) to be received enthusiastically in Medina was none but Prophet Muhammad (pbuh). Indeed the incident of the migration of the prophet and his persecuted followers is vividly described in Isaiah 21:13-17. That section foretold as well about the battle of Badr in which the few ill-armed faithful miraculously defeated the “mighty” men of Ke’dar, who sought to destroy Islam and intimidate their own folks who turned to Islam. For twenty-three years, God’s words (the Quran) were truly put into Prophet Muhammad’s mouth. He was not the “author” of the Quran. The Quran was dictated by Angel Gabriel who asked Prophet Muhammad (pbuh) to simply repeat the words of the Quran as he heard them. These words were then committed to memory and to writing of those who hear them during Prophet Muhammad (pbuh)’s lifetime and under his supervision (first of all was Imam Ali (pbuh), cousin of the prophet). Was it a coincidence that the prophet “who is like Moses (pbuh)” from the “brethren” of the Israelites (i.e. from the Ishmaelites) was also described as one in whose mouth God will put His words and that he will speak in the name of God (Deuteronomy 18:18-20)? Was it also a coincidence the “Parqaleeta” that Jesus foretold to come after him was described, as one who “shall not speak of himself, but whatsoever he shall hear, that shall he speak” (John 16:13)? Up to the time of Jesus (peace be upon him), the Israelites were still awaiting that prophet who is like Moses (pbuh) prophesied in Deuteronomy 18:18. When John the Baptist came, they asked him if he was Christ and he said “no”. Then they asked him if he was Elias and he said “no”. Then in apparent reference to Deuteronomy 18:18, they asked him “Are you that Prophet?” and he answered “no” (John 1:19-21). Indeed history tells us that may early Christians understood the Parqaleeta to be a man and not a spirit, This might explain the following who responded to someone who claimed, without meeting the criteria stipulated by Jesus (pbuh) , to be the awaited ” Parqaleeta “. It was Prophet Muhammad (peace be upon him) who was the Parqaleeta, Comforter, helper, sent by God after Jesus (pbuh). He testified of Jesus (pbuh), taught new things that could not be borne at Jesus (pbuh)’ time, he spoke what he heard (revelation). Such teachings will remain forever because he was the last messenger of Allah, the only Universal Messenger to unite the whole of humanity under Allah and on the path of PRESERVED truth. In Matthew 21:19-21, Jesus (pbuh) spoke of the fruitless fig tree (A Biblical symbol of prophetic heritage) to be cleared after being given the last chance of three years (the duration of Prophet Jesus’ ministry) to give fruit. In a later verse in the same chapter, Jesus (pbuh) said “Therefore, say I unto you, The Kingdom of God shall be taken away from you, and given to a nation bringing forth the fruit thereof” (Matthew 21:43). That nation of Ishmael’s descendants (the rejected stone in Matthew 21:42) which was victorious against all super-powers of its time as prophesied by Jesus (pbuh): “And whosoever shall fall on this stone shall be broken, but on whosoever it shall fall, it will grind him to powder” Matthew (21:44). Is it possible that the numerous prophecies cited here are all individually and combined out of context misinterpretations? Is it reasonable to conclude that all these prophecies, appearing in different books of the Bible and spoken by various prophets at different times were all coincidence? If this is so, here is another strange “coincidence”! One of the signs of the prophet to come from Paran (Mecca) is that he will come with “tens of thousands of saints” (Deuteronomy 33:2 KJV). That was the number of faithful who accompanied Prophet Muhammad (peace and blessings of God be upon him) to Paran (Mecca) in his victorious, bloodless return to his birthplace to destroy the remaining symbols of idolatry in the Kaba.